Big Cat Rescue gets more complaints about Tony the tiger at the Tiger Truck Stop than all other complaints combined. In 2009 the Louisiana Department of Wildlife and Fisheries had called Big Cat Rescue to come get Tony during their planned seizure of the tiger, but before we could take Tony, Sandlin filed for an injunction and the long legal battles began. That same year Big Cat Rescue was the first organization to hire an attorney to represent a tiger. David Nance, Esq. exhausted his ability to fight for Tony in the back water Iberville Parrish, but thankfully the national coalition of attorneys, the Animal Legal Defense Fund, took up the banner in 2010 and have vowed that they won’t give up. Big Cat Rescue offered to let Sandlin save face by sending Tony here quietly, where he could live under an assumed name and not be on our tour or used in any of our marketing, but Sandlin refused. The offer still stands because Tony’s well being is all that matters. On June 20th, Louisiana Governor Bobby Jindal signed a bill into law that could condemn Tony the tiger to a lifetime of captivity as a roadside attraction in a truck stop cage. You’ve been with us in every step of our fight to get Tony removed from his cage at the Tiger Truck Stop and retired to a reputable sanctuary. However, this new law Gov. Jindal signed will undo the legal victories won by ALDF on Tony the tiger’s behalf, and retroactively remove all the protections Tony received under Louisiana’s 2006 big exotic cats law. But we’re not giving up the fight to free Tony now. And we need your help! In addition to being an outrage, ALDF’s attorneys have determined this new law violates the Louisiana Constitution. So today, ALDF has filed a lawsuit to overturn this outrageous and unconstitutional effort to keep Tony caged in a gas station parking lot. After Tony’s owner, Michael Sandlin, repeatedly lost in the courts, he conspired with his local Louisiana lawmaker to exempt himself, and Tony, from the law that applies to all other citizen of the state. We won’t stand for this back-door sidestepping of the legal system and we know you won’t either. Please help us continue to fight for Tony. Your contribution of $25, $50, or $100 goes a long way to help ALDF continue our legal battle to provide Tony a new home in a spacious sanctuary — away from the noise and stench of a highway truck stop. Please make a gift to help ALDF fight for Tony today! Your support makes all our work possible. Thank you! There’s been much emotional rhetoric about Senate Bill 250, which would allow Michael Sandlin to keep his tiger, Tony, at his Gross Tete truck stop. The following time line may be useful to readers and Gov. Bobby Jindal, who will decide the animal’s fate. 1993: Iberville Parish Ordinance prohibits keeping wild animals as pets or for display. Despite this, Sandlin started buying, breeding, selling and exhibiting tigers at Tiger Truckstop. 2003: After numerous USDA citations for “unsanitary feeding practices, failure to provide veterinary care, shelter from inclement weather, clean drinking water and knowledgeable employees to care for the tigers,” three tigers were removed. Tony was left behind. 2006: Our Louisiana Legislature passed Act 715, requiring the Louisiana Department of Wildlife and Fisheries to enact regulations prohibiting citizens from keeping tigers as pets. They provided an exception for big cats legally owned before 2006 but required an annual permit from LDWF. Sandlin was ineligible because he and Tony do not live on the same property. 2009: Iberville Parish amended its ordinance to allow Sandlin to keep Tony if he met a number of physical conditions and was permitted by LDWF. Despite the fact that Sandlin was ineligible for a permit, the LDWF issued him one. 2010: The Animal Legal Defense Fund, along with several Louisiana residents as co-plaintiffs, sued the LDWF for unlawfully issuing Sandlin a permit. November 2011: Judge Michael Caldwell ruled that Sandlin was ineligible for a permit under state regulations and ordered LDWF to revoke Sandlin’s permit and not issue any new permits. ALDF filed another lawsuit demanding LDWF enforce the law. April 2013: Louisiana Court of Appeal agreed with Judge Caldwell that Sandlin is ineligible for a permit to keep Tony. Judge Caldwell’s original ruling that Sandlin cannot have a permit still stands. LDWF has agreed to uphold the law. Last month, Sandlin garnered enough support in our Legislature to create a new law, just as he had the Iberville Parish ordinance amended, just for him. In my opinion, this is a last-gasp attempt by Sandlin to avoid and evade the law. He has never had the “right” to keep a tiger at his truck stop, as he claims. Creating a loophole for one individual has attracted national attention and makes Louisiana look ridiculous. Tony is a pawn in this debate, but as a living creature, he doesn’t deserve to remain a roadside attraction at a gas station when he could live his remaining years free roaming at a big cat sanctuary. And, surely, Colorado is an environment much closer to his native Siberia than south Louisiana. Hopefully, Gov. Jindal will veto Senate Bill 250. It’s the right thing to do. Earlier: We just got word from the Louisiana State Senate floor that a very dangerous bill is now one vote closer to becoming law. If it passes, SB 250 would create a “retroactive exemption” to Louisiana’s ban on possessing dangerous wild animals. Specifically, it would allow Tony the Tiger to remain caged as a truck-stop curiosity where he is subjected to noise and diesel fumes 24 hours a day. As Louisiana supporters already know, this bill was designed to appease Michael Sandlin, whose captivity of Tony the Tiger was declared illegal by the Louisiana Court of Appeals in ALDF’s successful lawsuit. Sandlin has been repeatedly cited by the USDA for numerous violations of the Animal Welfare Act and had to remove his other truck-stop tigers as the result of the agency’s sanctions. Louisiana law rightfully bans private ownership of tigers and other dangerous wild animals. There are a few exemptions, but the law itself is clear. ALDF opposes the possession of big cats because it is inhumane to the animals kept captive, and dangerous to people. Exemptions to the ban on dangerous wild animals waste the state’s resources and put animals in harm’s way simply to accommodate those who want to confine tigers for entertainment or profit. This outrageous “exemption” bill will soon be considered by the Louisiana House of Representatives. We need to pull out all of the stops — so we are asking all Louisiana residents to contact Louisiana House Members right now to tell them that you strongly oppose any exemptions to animal protection laws. For those who are out of state, please join us in sharing this news on social media, so that we can reach more Louisiana residents! Share our recent Facebook update by clicking this link. Click here to send a tweet, and help us spread the word about this important action. Thank you for taking action to protect tigers from unlawful captivity! Big Cat Rescue has been working with animal advocates for more than 10 years for the day when Tony can finally be freed. Big Cat Rescue was the first organization to hire an attorney for Tony and to bring his plight national awareness. We stand ready to pick him up and bring him to Tampa where he can live out his life in a beautiful lakeside enclosure with a hillside cave, pool and world class staff and volunteers to cater to his every need. Everyone involved in Tony’s case knows that we would be happy to have Tony live out the remainder of his life here. At this time the decision of where Tony goes is still in the hands of his owner, Michael Sandlin who hates Big Cat Rescue for all we have done to free Tony. January 30, 2012: Last Monday, Judge Caldwell denied a motion brought by Michael Sandlin and the Tiger Truck Stop (TTS) that sought to suspend Judge Caldwell’s order while Sandlin and TTS appealed. In other words, Tony would have stayed put at the truck stop until after the appeal ran its course, which could take months. Instead, Judge Caldwell’s order instructing the Department to revoke the permit will go into effect right away. Sadly, this does not necessarily mean Tony is leaving the truck stop soon. Sandlin has filed his own lawsuit against the Department, which has been temporarily restrained from taking any action to remove Tony. ALDF attorneys are doing everything they can to resolve these conflicting orders to make sure Tony makes his way to a humane, accredited sanctuary as soon as possible. Update November 2, 2011: Great news from Baton Rouge, where Judge Michael Caldwell has ruled in favor of the Animal Legal Defense Fund and Louisiana taxpayers in their lawsuit to free Tony the Tiger from the Tiger Truck Stop in Grosse Tete, Louisiana. Please visit Tony’s blog http://freetonythetiger.wordpress.com/ for more articles about ALDF’s victory and how we can continue to advocate on Tony’s behalf. As our supporters know, the Animal Legal Defense Fund’s recent victory in our lawsuit to free Tony the truck stop tiger was extremely significant, because it finally puts a light at the end of the tunnel that is Tony’s imprisonment. Tony has lived at the Tiger Truck Stop in Grosse Tete, Louisiana for the past decade, and as a result of ALDF’s case, the annual permit that allows him to be kept there will not be renewed when it expires in December 2011. However, it was a qualified victory—because we were unable to get Tony released immediately. But we’re not giving up on that goal. That’s why ALDF recently filed a motion for a mandatory injunction that would compel the Louisiana Department of Wildlife and Fisheries to revoke the current permit and seize Tony—meaning that Tony would not have to wait until December to experience his new life beyond the Tiger Truck Stop. Although this specific request was part of ALDF’s original complaint, the court did not rule on it at the hearing last month. A new hearing on the motion for a mandatory injunction has been set for June 14. Stay tuned to the ALDF website, Facebook page, and Twitter for updates as soon as they become available. BATON ROUGE, La. – This morning, a judge in East Baton Rouge District Court granted the Animal Legal Defense Fund’s (ALDF) request for a permanent injunction against the Louisiana Department of Wildlife and Fisheries, preventing the Department from renewing the annual permit that allows Michael Sandlin, owner of Grosse Tete’s Tiger Truck Stop, to display Tony, a ten-year-old Siberian-Bengal tiger. When the current permit expires in December 2011, Sandlin will no longer be able to keep Tony confined as a roadside exhibit at the truck stop where he has languished for over a decade. The court also assessed costs against the Department in the case. In preparation for the day the current permit expires and Tony is finally free, ALDF hopes to work with the Department to find the best possible new home for him, providing recommendations for reputable sanctuaries where Tony can live out his life in a peaceful, natural environment, free from the 24-hour exposure to noise and diesel fumes that have plagued his life to date. ALDF’s lawsuit to free Tony has drawn the support of high profile advocates like Leonardo DiCaprio and True Blood’s Kristin Bauer and has galvanized activists around the world. This week, ALDF delivered to the Department of Wildlife and Fisheries over 31,000 signed petitions urging it to revoke Sandlin’s permit to keep Tony. Tony has been on exhibit at the Tiger Truck Stop since 2001; he has lived there with no other tiger companions since 2003. Joining ALDF as a co-plaintiff in the case is former Louisiana Representative Warren Triche, who authored the state’s law that led to the ban on the private ownership of big cats, including tigers. Two other Louisiana residents, also deeply concerned by Tony’s long-time suffering, are additional co-plaintiffs. The law offices of Baker, Donelson, Bearman, Caldwell, & Berkowitz, P.C. are providing pro bono assistance with the lawsuit. We still get calls and emails every day about what can be done to save Tony the truck stop tiger. It has been the most publicly decried account of animal abuse to come to our attention. 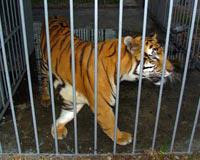 WE CANNOT BUY HIM as it is illegal to buy or sell a tiger across state lines and just perpetuates the trade. Veterinarians who will send us notarized affidavits that it is unhealthy to cage an animal at a truck stop next to gas pumps due to the fumes from the pumps and the 24/7 traffic of diesel trucks. Statements from veterinarians and other experts that attest to the fact that being kept on concrete is detrimental to the health and comfort of big cats. He has a grass yard, but is often prevented from accessing it, and there is no shade there. Eye witness reports, photos and videos of Tony living in squalor at the Tiger Truck Stop. http://freetonythetiger.wordpress.com/ This site has it all !!! Most people agree that a truck stop is no place for a tiger. The constant noise, exhaust fumes and taunting by the ignorant are cruel and inhumane. Billboards along the interstate tell commuters that Grosse Tete is a backwards sort of place by announcing that there is a captive tiger at the truck stop. It is no wonder that business development passes by this impoverished town. The notion of keeping a big cat in such a miserable environment would be any company’s first hurdle in ever being successful there. One man says mistakenly that having a tiger is what brings him business and money, but the rest of the town will continue to suffer from the bad name this activity has given Grosse Tete. Thousands of people around the globe have been following the plight of Tony the tiger and have called for the Iberville Parish to uphold the ban on such displays that they had since 1993. Instead of enforcing the ban and showing the world that Iberville Parish is a good place to live and work, they chose instead to change the law to fit the desire of one man who wants to keep a tiger in a cage. Perhaps none of the commissioners live in Grosse Tete. Their actions indicate that they don’t care what visitors or potential businesses think of this ugly blight on Louisiana’s reputation. If you live in Grosse Tete, your voice matters the most and there are still 2 things you can do about it. The Tiger Truck Stop has to have a permit to display the tiger from the Louisiana Department of Wildlife and Fisheries. 1. Talk to Michael Sandlin about the bad image his ego is giving the community and ask that he send Tony to an accredited sanctuary. 2. Refuse to shop or eat at the Tiger Truck Stop until Tony the tiger is relocated to an accredited sanctuary. Sign up in the box at left if you wish for us to keep you up to date on Tony the Truck Stop Tiger. The Iberville Parish has allowed Michael Sandlin to keep Tony the tiger at the truckstop. Read the ordinance HERE. Now he must obtain a permit from the Louisiana Department of Wildlife and Fisheries. Please contact them and ask that they NOT issue a permit to the Truck Stop and that they send Tony the tiger to Big Cat Rescue in Tampa, FL. Big Cat Rescuers visited the site and noted that the fumes were noxious and the sound of the dieseling trucks was deafening and unrelenting. There are flood light’s on the tiger’s cage so that he never has a minute of darkness and never gets a moment of peace from those who yell at him and throw things at him to make him move. We are trying to convince the Iberville Parish that the right thing to do is let the Louisiana Department of Wildlife and Fisheries send Tony the tiger to Big Cat Rescue. They seem to be more inclined to amend their ban so that they can justify not enforcing it. They need to hear from you. Below are ways you can help. Help Free Tony the Truck Stop Tiger. Another thing you could do that would be very helpful and only takes a few words is to set up a google alert. If you google that term “google alert” you will see how. Make it for “tiger truck stop” or for other terms that matter to you like “lynx fur” or “fur coats” or “big cat abuse” or whatever. Then, every time those terms show up in the media, you can go to the post and see if there is a way to post a comment. This way you are talking to people about the issues right when they are thinking about them and you can change the discussion by giving them facts from our web site. In some cases you can even link them to our website, which is the best kind of incoming link and raises our rankings in google so that when people are searching big cat terms they find us. For the places that won’t let you post a link you can write FreeTony dot com or BigCatRescue dot org so people can type it into their browser. It isn’t as good as a link, but is the next best thing. KIds can help too! Click the picture to download a coloring page you can fill in and send. Or draw a picture or write a letter telling why a truck stop is no place for a tiger and send it to the Iberville Parish Council at 58050 Meriam Street Plaquemine, LA 70764. The painting of the tigers in the snow was done by Angela J. Phelps, an 8Th grade student at L.J. Alleman School of Art and Technology Middle School, Lafayette, Louisiana, in Lana Badeaux’s art class. Painting copyright 2008 by Angela J. Phelps. This is Angela’s way of saying that young people care about Tony and want to see him freed from the truck stop to live in a more natural environment. Click the image to see a larger version. Sec. 3-91. Display of wild or exotic animals prohibited. No person shall keep or permit to be kept on his premises any wild, exotic, vicious animal or reptile for display or for exhibition purposes whether gratuitously or for a fee. This section shall not apply to zoological parks, performing animal exhibitions, circuses or veterinary clinics. Sec. 3-92. Wild or exotic animals as pets prohibited. No person shall keep or permit to be kept any wild, exotic, vicious animal, or reptile as a pet without having first obtained a license from the animal control shelter. Sec. 3-93. Posting of notices. Sec. 3-94. License for wild animals. (a) The animal control director may issue a temporary license for the keeping, care and protection of injured wild animals or infant wild animals or infant wild animals native to this area which have been deemed to be incapable of surviving without assistance. (b) Any person wishing to house a wild, exotic animal or reptile as a pet must demonstrate knowledge of the proper care for the animal or reptile involved and must have facilities for their care inspected by the animal control director. It shall be the responsibility of the director to issue or deny a license following the inspection. (c) Any denials will be explained in writing to the owner. Any person aggrieved by a decision of the director may appeal such decision to the police jury and district court as provided in Chapter III, Livestock. Sec. 3-95. Release of wild animals. The animal control director shall have the authority to release or order the release of any wild animal or reptile kept under temporary license which is deemed capable of survival. Sec. 3-96. Disposition and impoundment. Any person who keeps a wild, exotic or vicious animal in contravention of this chapter may dispose of the animal or reptile by removal of the animal or reptile from the parish, by giving or selling the animal or reptile to a zoological park or by releasing the animal or reptile to the wild, to a zoological park, or to a responsible adult who shall remove the animal or reptile from the parish, or dispose of the animal or reptile in some humane manner. The director of the animal control shelter is authorized to release the animal or reptile to any licensed institution for research purposes. ★★★ THIS ORDINANCE STAYED IN PLACE UNTIL 2009 WHEN THE COUNCIL MEMBERS CHANGED IT TO SATISFY 1 RESIDENT MICHAEL SANDLIN…..
help free tony he dosen't do't deserve this. Maryland Zoo holds first "Enrichment Weekend"